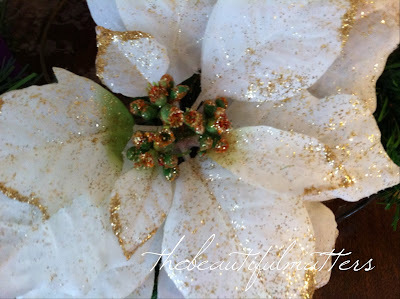 I am linking up today with Tablescape Thursdays at Between Naps on the Porch. 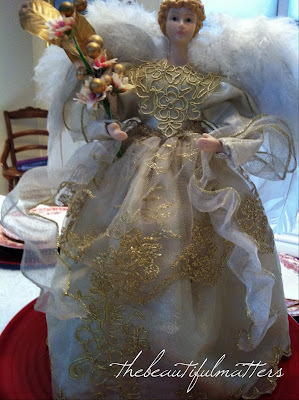 Otherwise, there is no way I would have got my Christmas table decorated and set already. 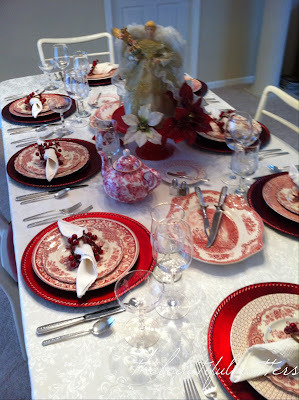 Thank you to Carolyn from Aiken Home and Gardens for inspiring me to use my red transferware. I was going to use either my Christmas dishes or Friendly Village set. But this red definitely seems Christmas-y to me. My table has lots of memories on it. I have my mother-in-law's silver that she bought before she was married, piece by piece every Friday night after getting her paycheck from Dodge Main in Detroit. I have the champagne glasses she got as wedding gifts in 1949. Some of the red transferware is from my grandmother, who purchased it with her first paycheck working as a tour guide at the Orchard House in Concord, Massachusetts, where Louisa May Alcott wrote her famous Little Women. My table also has linen napkins that are probably around 100 years old, from my mother's second husband's first wife's mother. Yes. And somehow I got them. Barely used, they are soft and lovely. An angel smiles benignly down from a red cake stand, surrounded by glittery poinsettia leaves and pine cones. This china is Bristol by Crown Ducal. 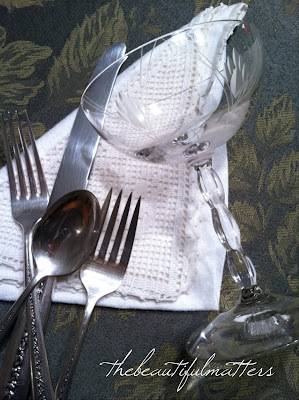 I inherited eight place settings from my grandmother, but a number of the pieces were chipped and crazed. 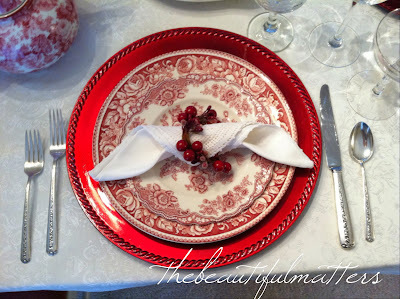 The cost of buying additional pieces was prohibitive, so I began a piece-by-piece search for red transferware in antique stores in the area and even out of state. I have a nice collection now, and mix them up altogether in my table settings, but my favorite pieces remain those from my grandmother . . .
We got the table and chairs years ago from someone in our neighborhood having a garage sale. We had packed up the kids to go off for a picnic at the lake one Saturday and passed by a driveway where I saw this beautiful table with six chairs, the seats all embroidered in different floral patterns . . . The wood was blond, but we sanded it down and painted it an antique white. hmmm . . . I wonder if kitty will leave my table alone? I love the stories behind your silverware and dishes! Those were the days when so many women had Hope Chests. 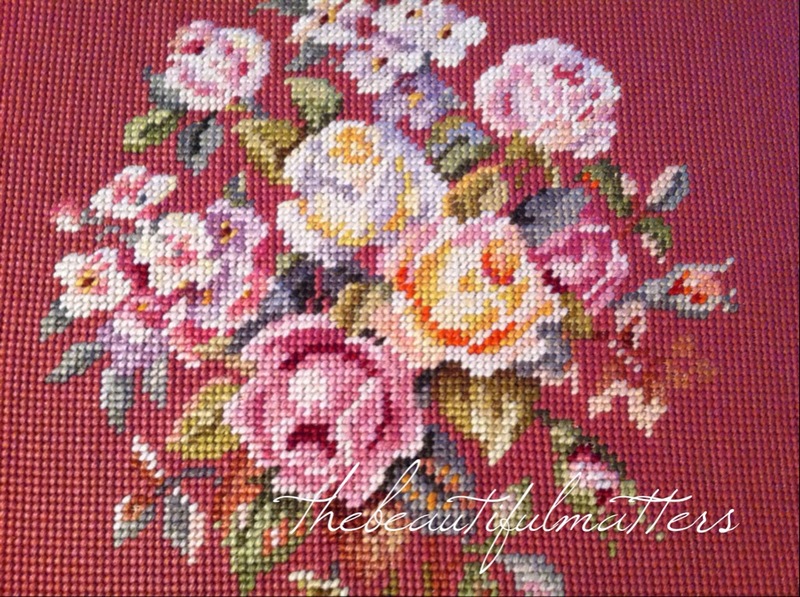 The needlepoint in the chair is fabulous! What a treasure What a lovely table! I love it all! thanks Maria for stopping by! yes, I am very fortunate to have inherited china, silver, and linens from both sides of the family. I cherish it all. I too have patterns from grandmothers and aunts but since I bought an inexpensive "Christmas" set of dishes, I use them from Thanksgiving to Valentines, then up they go back to the top shelves of my cupboards. I love your beautiful dishes though. The table is lovely. Also, I baked your cranberry pecan pie. It was wonderful...a nice change from really sweet desserts we have been having. thank you Rosie! buying it piece by piece takes more time, but it is fun, and each piece tells a story. 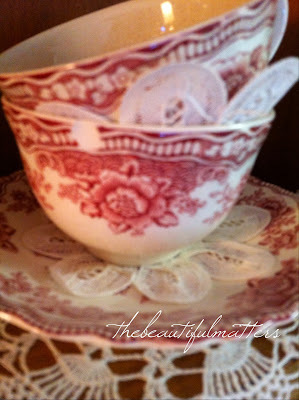 ~Gasp~ your RED transfer ware is just gorgeous! In fact, this whole table is gorgeous! Well done! You've given me inspiration to use my Pink Willow with RED chargers for Valentines Day this year. I love how pretty the effect is & hope that my pink will look similar. Must go test it out while I still have the red chargers out for Christmas. So delighted you enjoyed it, and I'm glad you found some inspiration. Hope it works out for you. Bristol by Crown Ducal is one of my favorite transferware patterns. I love the red color. 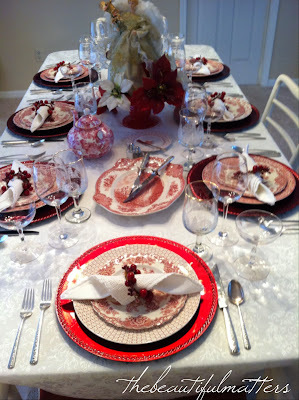 It mixes so well with most of the other red transferware patterns that are available. The table is lovely, and with it's rich family history it is a very memorable Christmas setting for your family to remember. thanks for stopping by Candy. Yes, this pattern has looked nice with all the other red TW I've found.